US Secretary of State says failure to implement 'two-state solution' - not apathy to Islamism - has led to rise of ISIS worldwide. US Secretary of State John Kerry on Thursday called for a resumption of the Israel-Palestinian Authority (PA) peace process, claiming the talks were vital in the fight against Islamic extremism. "It is imperative that we find a way to get back to the negotiations," Kerry said at a State Department ceremony marking the Muslim festival of Eid al-Adha, which celebrates Abraham's "sacrifice of Ishmael" in an appropriation of the original Torah story. Kerry insisted at the ceremony that it was a lack of a "two-state solution" - not Western apathy to brutal Islamism - that is to blame for the rise of the radical Islamist group Islamic State (ISIS). "We need to find a way to create two states that can live together side by side, two peoples, with both of their aspirations being respected," Kerry insisted. "I still believe that's possible, and I still believe we need to work towards it." Palestinians, because it was a cause of recruitment and of street anger and agitation," Kerry claimed, referring to a visit to Cairo that raised $5.4 billion for Hamas in Gaza on Sunday. He further implied that Israel was responsible for "humiliating" the Palestinians. "People need to understand the connection of that. And it has something to do with humiliation and denial and absence of dignity," he said. Kerry was the architect of the resumption of the peace talks between July 2013 and April - a process which imploded after the PA violated the Oslo Accords by appealing to the international community for legitimacy, and then made a unity pact with the terror group Hamas. During those talks, Kerry was revealed to be orchestrating the European boycott threats on Israel in an attempt to pressure the Jewish state to submit to concessions against its interests. Despite this, the US has previously claimed Hamas was not represented in the unity government to justify its supportive stance towards it - even though one of the unity government ministers was previously the education minister in Hamas's Gaza government. That stance was made further questionable last Thursday when the unity government held its first cabinet meeting in Gaza and called for elections jointly with Hamas. 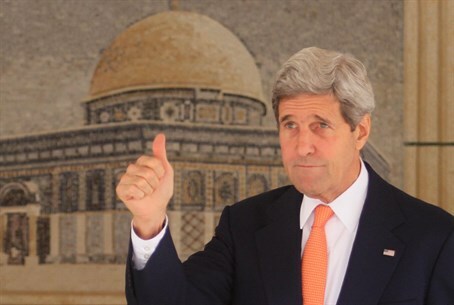 Kerry's statements follow a series of US - not Israeli - failures in dealing with Islamism. In 2007, then-President George W. Bush predicted that pulling US troops out of Iraq too early could have disastrous consequences for the region. ISIS - which rose out of Al Qaeda, then broke away after the latter group's leaders called its policy "too extreme" - did indeed take power in Iraq, just months after the US officially left the region. US airstrikes against the group began this summer. More recently, Kurdish intelligence forces revealed to British media that they had alerted the US months in advance that the extremist group was gaining ground in Iraq - but the Obama administration allegedly did nothing. Obama later admitted he had "no plan" on ISIS in August.